Seal are part of the family Pinnipedia. Pinnipedia means winged-feet and refers to the seal's flippers. Seals are divided into two families, the Phocidae, which includes the earless or �true� seals and the Otariidae, the eared seals (aka sea lions, furred seals). Size: Seals in a variety of shapes, sizes and colors. 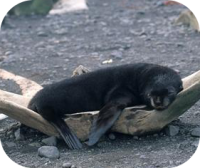 The smallest seal is the Galapagos fur seal, which measures 4 feet in length and weighs 65 bls. 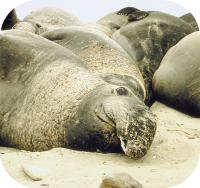 The largest seal is the Southern Elephant seal, which measures up to 13 feet in length and weighs up to 2 tons. 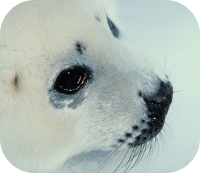 Habitat: Seals can be found in almost all ocean waters around the world, from the Arctic to tropical waters. Seals can be found in a variety of ocean habitats. The largest concentrations of seals are found in California and New England. Most seals are found in coastal waters and rocky shores. Diet: Seals are carnivores. 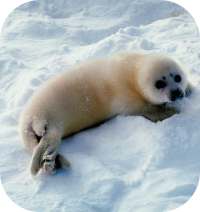 Seals feed on smaller aquatic animals, including fish, crustaceans and squid, and some seal species feed on penguins. Senses: Seals have a keen sense of smell in air. Description: Like all mammals seals are warm blooded, the seals that are in cold waters have thick layers of blubber to keep them warm. Seals that live in warmer waters have less blubber. A seal's body tapers from the chest towards the tail. 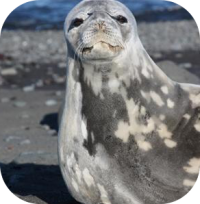 Seals can be brown, tan, white, or black, some species have mottled coloring. Behavior: Seals spend about half of the time in water, and the other half is spent on land. Most species of seals return year after year to the same area. 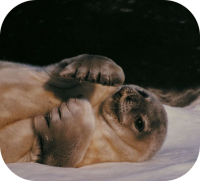 Gestation: Seals carry their young 8 to 12 months, depending on the species. Birth: Seals give birth on land. Seals typically give birth to a single calf at a time.The pups develop rapidly, with some able to swim within a few hours of birth. 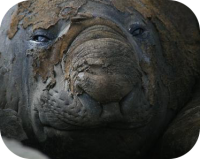 Sexual Maturity: All eared and earless seals are polygamous. The mature bulls gather a harem of females. The size of the seal harem, ranges from 3 to 40 females. 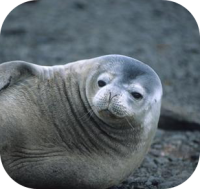 Life Span: Most seal species live in the wild 20-40 years or more depending on the species. 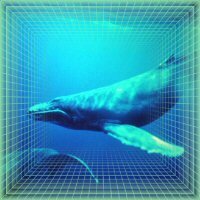 Predators of seals include sharks, orcas and polar bears. Athleticism: Seals can swim up to 15 to 18 mph.